In consolation for not keeping products in stock, Home Depot offers free delivery and free removal of the old unit so that’s something to appreciate. It will be nice to not have to manhandle the two stoves up and down our stairway ourselves. So, if all goes well, we will have our new stove/oven just in time for Thanksgiving. Cross your fingers for me. Last night’s dinner was an exercise in experimentation and although, as Don put it last night, it doesn’t make for a very “pretty” plate, it was damn good. 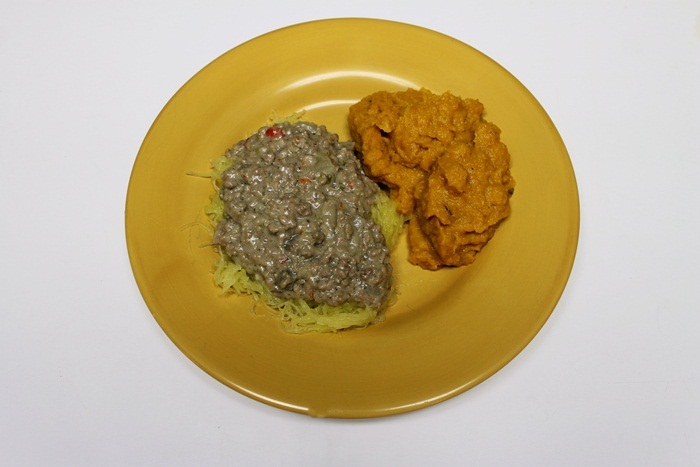 We made ground pork, smothered in mushroom gravy, which we served over spaghetti squash, and mashed butternut squash on the side. I know, sounds kind of weird, right? But sometimes you just gotta take a chance and see what happens. We if hadn’t, we would have missed out on an awesome meal. Smothered pork chops served over rice is an old favorite from our pre-paleo/primal days. Since rice is no longer a staple for us we were in search of options. We had a spaghetti squash waiting to be used for something so Don thought we’d give that a try. 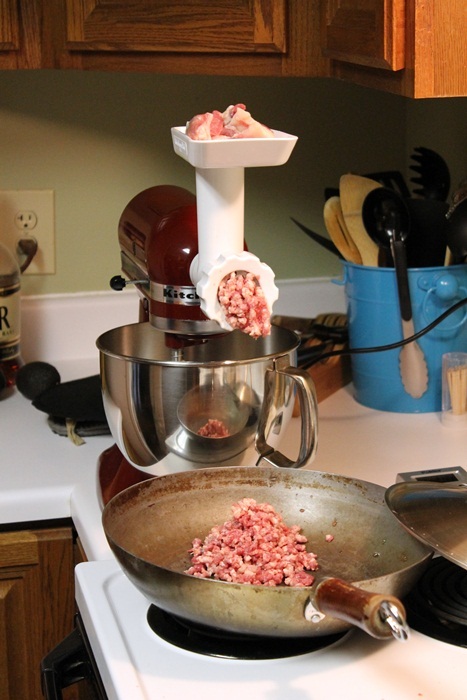 We didn’t have any pork chops available but we have tons of hog meat ready for grinding for sausage, etc. So we defrosted one of our 1 lb packages and ground it right into the pan. After browning the meat a little, Don added onion, green onion, some spicy red peppers from our garden, and a can of condensed cream of mushroom soup, probably some salt, pepper, and garlic too. What meal would be complete without those few essentials? This simmered for over an hour while we did some projects around the house. We could have cooked it for less time but it’s a convenient dish that can be left to simmer for long periods at a low temp while you handle other things that might be demanding your attention. Eventually, because we had to eat sometime, I tackled the two squash. The spaghetti squash I cooked the usual way; see this post for our method. 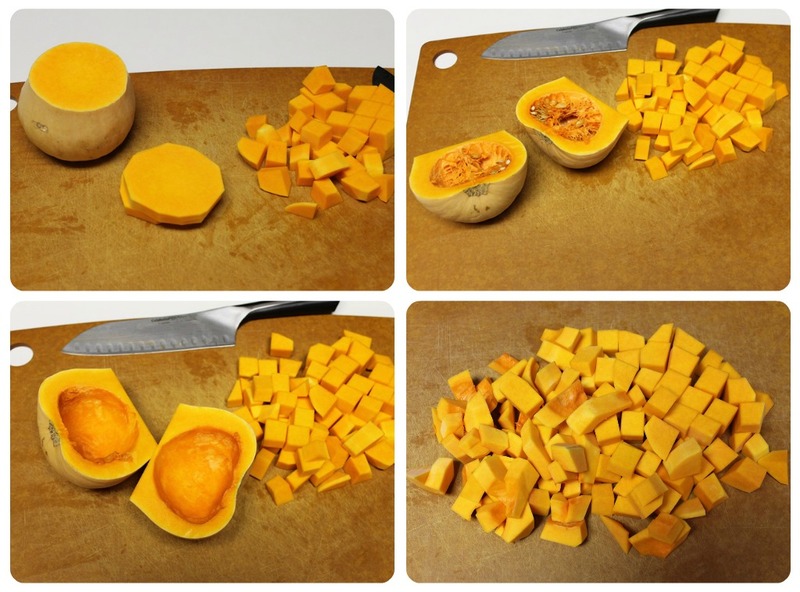 The butternut squash has been sitting around waiting for a recipe I want to try – that requires an oven! grrr. We decided it was time to find another use for it; we were not sure what its shelf life was. We were curious whether it would make a good mash, and whether we could steam it for mashing. From a quick scan on Google, it looked to me like most people prefer to roast it or make soups from it. Even the recipes I found for mashing it called for roasting it first. But I found one recipe that referred to steaming it so we decided that was enough confirmation to give it a try. and placed it in a pan with about an inch of water. I brought it to boil and turned it down to medium and steamed it for about 20 minutes (until the squash was soft.) I had a bit of a scare because my water boiled off and my squash started to burn to the pan, but I saved it pretty quickly. I was multi-tasking a bit more than I should have been when doing something new. But, no harm. It still turned out great. At that point I drained the squash and added butter, salt, and pepper. The squash was so soft I only used a fork to break it down and a mix it all together. It reminds me of sweet potatoes. It’s good. Our squash was about 1 lb and we ate the whole thing. All in all, the meal was a resounding success given all the experimentation. I was not confident that the meat and gravy was going to work with spaghetti squash but I need not have feared. It might sound weird but it sure tasted dandy. I have been meaning to try mashing a butternut squash in lieu of potatoes. I think I will now. As for a rice substitute, I really like running cauliflower throught the food processor and then microwaving the bits for a couple minutes. I think it tastes better than rice and has the exact same texture. That’s interesting to hear – that you’ve adapted to cauliflower for your rice. I seem to remember you saying cauliflower was smelly and it didn’t work for you. I’ve found that not all cauliflower has a funky smell; if I get a head of cauliflower that is really fresh and I use it right away I don’t notice the smell that seems to come on as the cauliflower gets at little old. Still good eats when steamed though.